Croatia must close a section of the ground for their next Euro 2016 home qualifier as a Uefa punishment for fans' racist behaviour and crowd trouble against Italy. Referee Bjorn Kuipers was twice forced to stop the 1-1 qualifying draw with Italy on 16 November and 16 Croatia supporters were arrested. European football's governing body Uefa charged the Croatian Football Federation (HNS) for racism from the stands as well for as crowd disturbances and their fans setting off fireworks and throwing missiles at the San Siro. They must close 8,000 seats of the Maksimir Stadium in Zagreb for March's game against Norway. 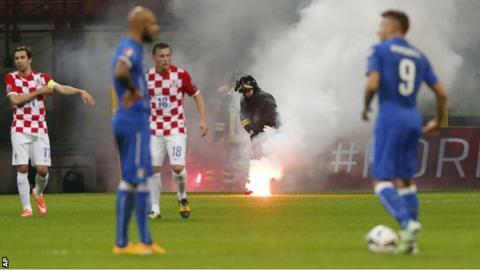 The HNS has also been fined £63,000, while its Italian counterpart was fined £10,000 after home fans set off fireworks too. Croatia coach Niko Kovac said after the game he expected punishment from Uefa. "Of course Croatia will face sanctions, but there is no reason for any point deductions," he said. Croatia are top of qualifying Group H on 10 points and lead Italy on goal difference.